September 30 of this year marks thirty years since Canadian National (CN) terminated railway operations on the island of Newfoundland. The decision to abandon the system had been made late in 1987 when the Conservative government of Brian Peckford agreed to let it go in exchange for a one-time payment from the federal government for highway improvements. Why there was pressure from CN to abandon the railway in the first place? The mainstream narrative is that it was due to the limitations of the railway’s design. Chief among these was its 1,067 mm (3′ 6″) narrow gauge track, to cut construction costs. Without getting too technical, narrower gauges mean smaller and lighter equipment and infrastructure, as well as allowing track to be laid in tighter turns, better suited to build around geographic obstacles instead of expensively blasting or cutting through them. There was also debate over the actual route which was caught up in the imperialist rivalries of the day; with much of western Newfoundland’s coast being part of the “French Treaty Shore”, a direct route to the Gulf of St. Lawrence and a new port to the mainland was not possible. By the mid-1890s, the railway’s builders decided to ignore diplomatic niceties and laid the track through to the south west corner of the island anyway. By that point the narrow gauge “cost-saving measure” had racked up quite a substantial bill, and was so full of sharp curves and steep grades that the trains ran slow even by the modest standards of that time. Passenger trains running from St. John’s to Port aux Basques took 28 hours to travel about 900 km. The railway was mired in other controversies. There was, for example, the shady US-based firm that went bankrupt after only 90 km of construction, and then the takeover of construction by the Montreal-based Reid Company, which was awarded vast tracts of land for development, as well as major colonial assets including the coastal ferries, telegraph system, St. John’s streetcars, the St. John’s drydock, and the Petty Harbour hydroelectric plant. There was also the insistence on building extensive branch lines when the mainline itself had so many limitations. The Reid company eventually wanted out and the dominion government took it over as a public asset in 1923. 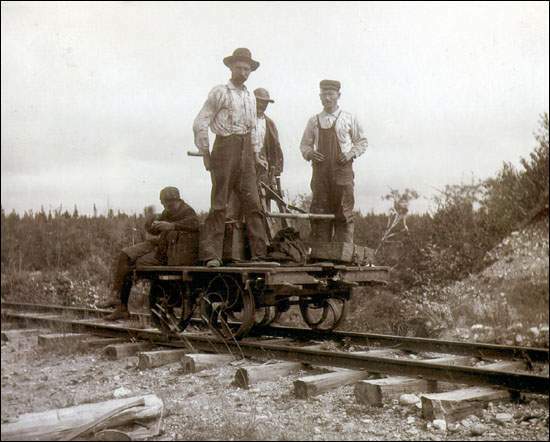 For all its faults, the railway in Newfoundland served its purpose: it got people around, and facilitated economic development in the central and western parts of the island, particularly the mining and logging industries. CN assumed ownership of the railway under the terms of union between Newfoundland and Canada, and to its credit CN embarked on a number of improvements to the network on the island: diesel locomotives, new rolling stock, heavier rail on the mainline, and new larger ferries for the Nova Scotia route. Even with these improvements, travel times were slow compared to the new highways being built in the 1960s. Passenger trains were phased out in 1969 in favour of buses that could make the trip in nearly half the time. Freight continued well enough into the 1980s, and CN was exchanging wheelsets in Port aux Basques so standard gauge cars would run on narrow gauge and vice-versa. Standardization was something that was talked about but never seriously pursued. The narrative generally stops here. It says costs were too high and service too slow to justify continuing the railway. Freight volumes did drop in the late 80s, but that need not have been inevitable. In reality, the railway was undermined by CN and the federal government itself as the trend of neo-liberalism began to take hold. From 1978 on, CN was expected to pay for itself, and promptly began separating lines administratively to determine the extent of “money-losing routes”. Operations in Newfoundland were rebranded as “Terra Transport” and little else changed aside from the adoption of intermodal containers. The Canadian Transport Commission also modified freight rates in the 1980s, much to the pleasure of private trucking interests which most certainly saw a publicly subsidized rail service as unfair competition. CN itself operated freight trucks on the island. Deregulation in 1987 was the death knell. The railway in Newfoundland was deemed redundant, and to be abandoned in exchange for paying the province approximately $800 million to improve highways. This “roads for rails” deal was a convenient way for the federal government to disregard the 1948 Terms of Union article which stipulated federal responsibility to operate and maintain railway service in Newfoundland. The last revenue trains ran on September 30-October 1, 1988. Within weeks of the last revenue trains running, CN had crews dismantling the railway, leaving little left by 1990 except a handful of community displays and some abandoned maintenance sheds. PEI’s railway shared the same fate, as did numerous other branch lines deemed redundant by CN. Hundreds of good jobs were lost and a important part of the island’s transportation infrastructure had vanished. The expected highway improvements began once all the track was out of the way; the most extensive work was expanding sections of the TCH near Corner Brook and St. John’s into a four-lane divided road. Beyond that, Newfoundland’s road network has not changed significantly. Many secondary roads in rural areas are plagued by potholes and other defects, getting by with occasional patch-jobs. CN’s privatization in 1996 led to their trucking service being sold to a private company, and also ended the island’s publicly-run highway bus service. That service, which had its own dedicated depots and offered access to areas off the main highway, was sold to another private company which operates only on the main road, only one type of bus (no “express” service), and lacks its own stations, renting instead from gas stations and motels along the way. There do exist some smaller local bus/taxi companies, but for most residents of Newfoundland, owning a car is the only practical means of getting around. Both the island and Labrador need a revitalized publicly-owned transportation network that is accessible, affordable, comprehensive, and efficient, especially if we are serious about reducing our reliance on individual vehicle ownership and the environmental impact that entails. That might include a new railway, but that is a matter of future discussion.